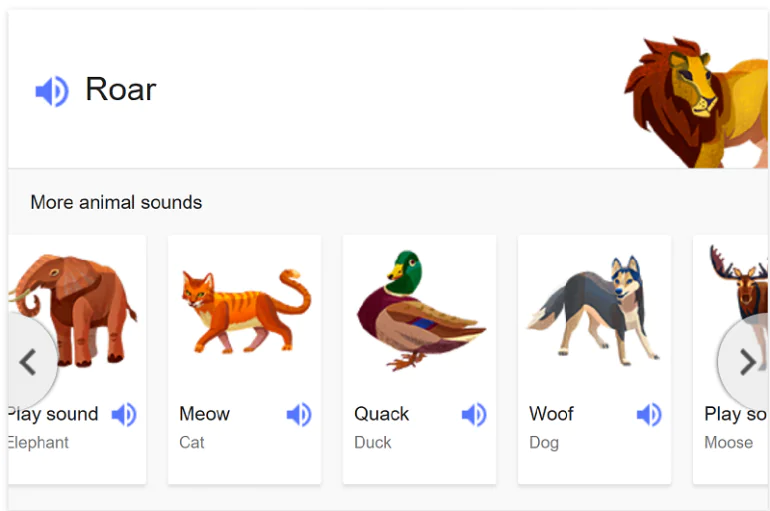 Google has announced a new feature on Search called Animal Sounds. This new feature will enable users to search for sounds produced by a particular animal on Google. This seems like a neat feature for those that want to know what animals other than a fox sound like. Currently, there are about 19 animals sounds present on Search. Some of the animal sounds that are available include cat, cow, elephant, zebra and a few others. Interestingly, there is even a humpback whale audio clip, which was a mystery to me before using Animal Sounds. According to Google, Animal Sounds was recorded with real life animals instead of using computer generated sounds. The 19 animals were included because they are the top searched animals on the search engine. Surprisingly, marmots weren’t included. To use this feature, one has to simply key in the following phrase on Google: What does the (insert animal name) say? One will then be presented with a picture of the intended animal along with an audio clip. This can be done either on the web, iOS or Android. The list of all 19 animals that are included in Animal Sounds can be found here. Tags 19 animal sounds on google search Animal Sounds Animal Sounds Android animal sounds clips on google search Animal Sounds Google Animal Sounds iOS Animal Sounds on Google Google Google Animal Sounds Google malaysia Google new animal sound addition Google search new feature What does the Humpback whale say?